These pulled pork sandwiches are perfect for a summer cookout, or for a simple dinner recipe. The pulled pork is quick to prepare in your crock pot and will be ready over night or after work. Slaw is great on sandwiches and by itself try this Kale Slaw for another variety. Put everything in the slow cooker (crock-pot) and turn the heat to medium. Cook, undisturbed, for 8 hours or until it is fork-tender (about 190°F with a meat thermometer). Remove the pork from the slow cooker but keep the liquid. While still hot, use two forks to shred the meat. Remove any fat found between the shreds. Skim as much fat as possible from the liquid in the slow cooker. Add about 1 cup of the cooking liquid to the shredded pork. Put the shredded cabbage and carrots in a bowl. Mix the canola oil, vinegar, salt and pepper in a small bowl and stir or whisk well. Add the dressing to the cabbage mixture and coat thoroughly. 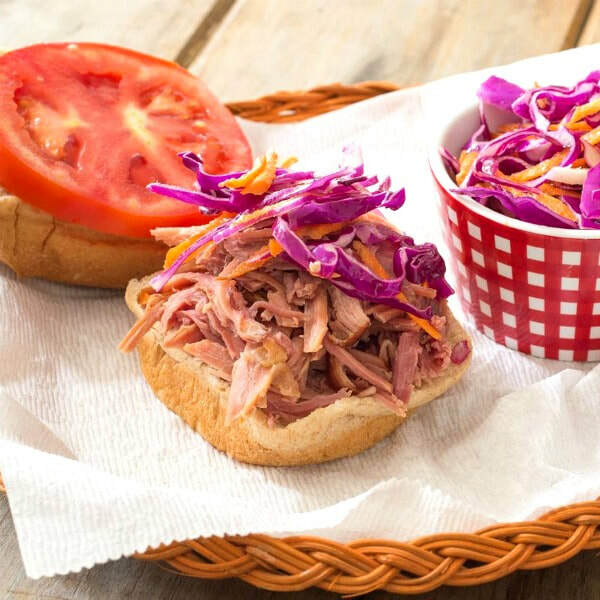 Add ½ cup of pulled pork to each roll or bun and top with ½ cup cabbage and carrot slaw. Serve right away.